A new £4m business centre for companies in the renewables and environmental technology sectors has officially opened its doors during Humber Business Week. The ergo centre is situated at the heart of the Energy Estuary, in a prime location on the Bridgehead business park, close to the Humber Bridge. 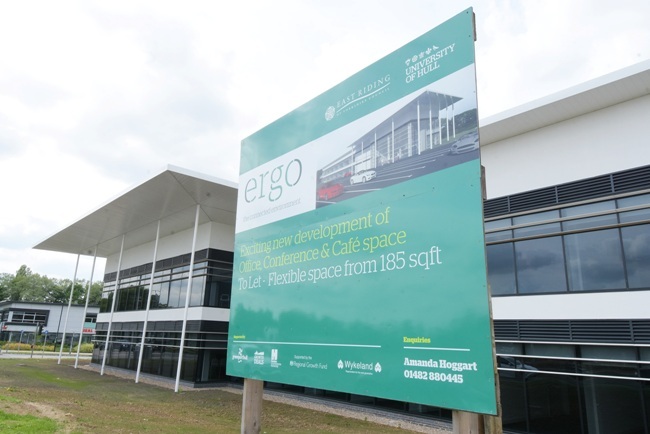 Operated by East Riding of Yorkshire Council, in partnership with the University of Hull, ergo provides flexible and modern office space and conference facilities with on-site parking. The official opening was attended by local dignitaries, representatives from the business community and industry leaders. Coun Stephen Parnaby OBE, leader of East Riding of Yorkshire Council, said: “It’s fitting that the official opening of ergo takes place during Humber Business Week, which showcases the wealth of talent, entrepreneurship, vision and future potential of the region. The ergo project was developed by the council in conjunction with regeneration company Wykeland Group, owner and developer of Bridgehead, and construction of the facility was undertaken by Hessle-based contractor PDR Construction. Dominic Gibbons, managing director of Wykeland Group, said: “The ergo centre is the latest prestigious facility at Bridgehead and its opening marks another key landmark in the rapid growth of the business park. As well as £2m capital investment from the council, £1m was secured from the Government’s Local Growth Fund via the Humber Local Enterprise Partnership (LEP), around £710,000 from the Green Port Growth Programme, supported by the Regional Growth Fund, and an equity investment from the University of Hull. Lord Haskins, chairman of the Humber LEP, said: “The partnership support for this project reflects the significance of the energy and renewables sectors to the Humber. “The location of the ergo centre – so close to the estuary – provides excellent access for both banks of the Humber, which makes for easy access and transport for businesses across the region.